In my lifetime, there has only been one horror movie that had any sort of lasting impression on me, that actually caused me to have nightmares, that actually altered my behavior. It was a movie I saw in 1975 at the theater on opening weekend, at the ripe old age of 14. The movie was Jaws, and from the amazing opening sequence in which Chrissie gets turned into fish food, I was hooked. Jaws is one of those films in which everything went wrong in production, and everything went right after. 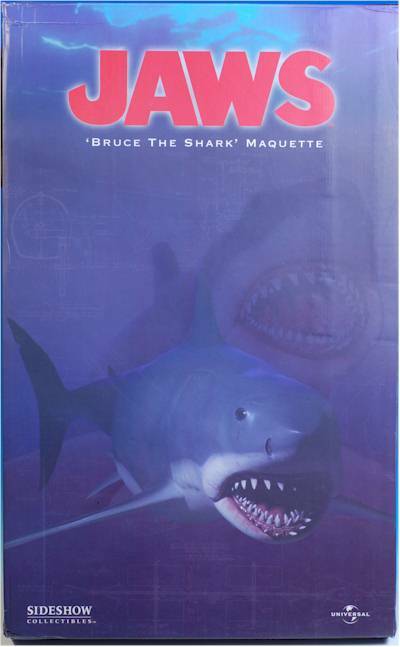 This was a film that looked like it was cursed from very early on, and a large part of that was due to Bruce, the mechanical shark. He rarely worked, and because of that was featured only in brief glimpses through much of the film. Of course, we know now that this is what helped to make the film work, and it catapulted a young Steven Spielberg to fame. 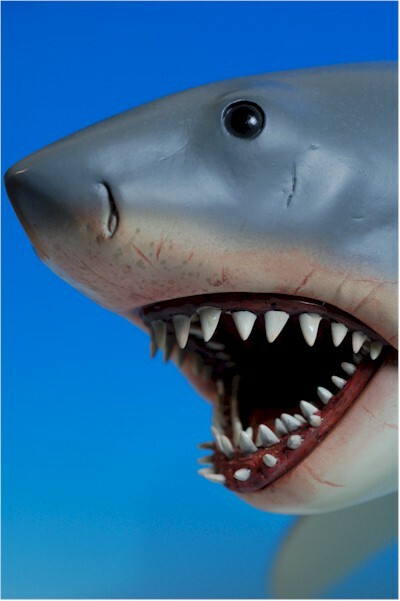 Sideshow is producing a huge maquette of Bruce the shark, done in both an exclusive and non-exclusive version. The exclusive includes a copy of the blueprints and original drawings of Bruce. I'm not reviewing the exclusive tonight though, just the standard. Both cost about $280, and the exclusive is a limited edition of just 250. They haven't set the edition size on the regular yet. It's one big box. Think a Premium Format figure, than think a little bigger. Since Bruce has to come all in one piece, and since he's about 28 inches long from nose to tail, it has to be a pretty damn tall box. He's also 16 inches wide, so he'll definitely take up some shelf estate. The outside of the box looks great, with some nice graphics, but this kind of design never allows for a ton of text. The interior foam is the high quality stuff, and he's nicely cradled with little chance for breakage. He's easy enough to take out and put back as well, for those of you storing him in between display sessions. Put this maquette on display in your media room, without the name plate, and I guarantee people will know it's Bruce. Compare it to actual photos and screen shots of Bruce, and you will notice that there are differences, but without that immediate reference material you won't be able to tell the difference. In reality, this version of Bruce looks much more like an actual Great White than Bruce did. Bruce had a much larger mouth, taking up far more of his head, but that wasn't quite realistic. 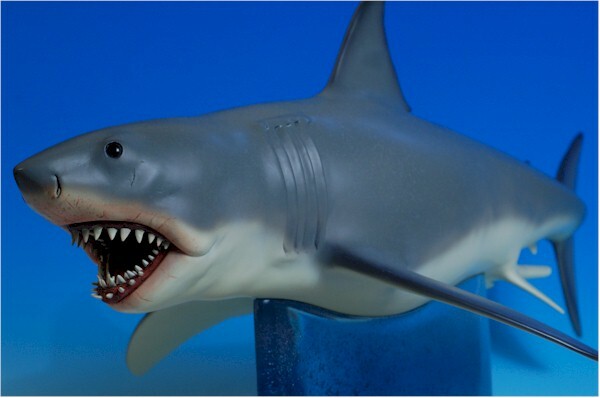 The proportions here between the snout, eyes, head and jaws are actually much more like an actual shark, but that does mean they aren't quite movie accurate. I suspect that's partly due to the reference material. 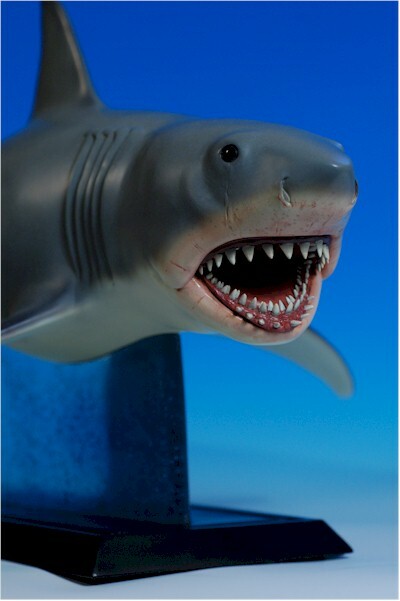 The sculpt was based on the paper designs and drawings, rather than the actual shark. I'd be surprised if any of the actual sharks used in shooting have survived this long, so going back to the drawings makes sense. But the original designs could have easily been more like actual sharks, and the actual physical version of Bruce tweaked for maximum screen presence. Bruce's scale is kind of up in the air. They estimated him at 20 feet at one point in the film, only to later realize they needed a bigger boat. Let's pretend he was actually 25 feet long - that would mean he'd have to be 50 inches long in sixth scale, and even if he was just 20 feet long (just!) he's still have to be 40 inches long to be sixth scale. Clearly, he's too small for that. But at 28 inches long, he's about 1/10th scale, about the same as a 7" line of action figures. He should work fine with most figures in the 6 - 7" range (that's a six inch Spider-man in his mouth), and if someone ever does do a Jaws line of action figures, we can always hope their in the 7" range. The paint is spot on beautiful, although there were a couple spots I would have liked to see more detail. The color of the body and belly seems dead right, with a nice smooth transition between the two. There's a realistic blend, rather than anything abrupt, lending to the overall appearance of an actual shark. There's some spotting and variation in the gray back as well, so that the paint provides the look of texturing to the skin. The eyes are jet black, just like they are described in so many recounts of attacks. There's a wonderfully realistic spotting around the mouth and teeth, and the mottled red just inside the mouth looks terrific. The only area that was a tad lacking for me was deeper inside the mouth, where the dark red was a bit too even and consistent. More detail inside there would have been nice, but unless you're really looking for it, you won't even notice. Obviously, a maquette doesn't really come with accessories, but I'm counting the base here because I feel it deserves some discussion all it's own. For a maquette like this to work, it really requires a special base. 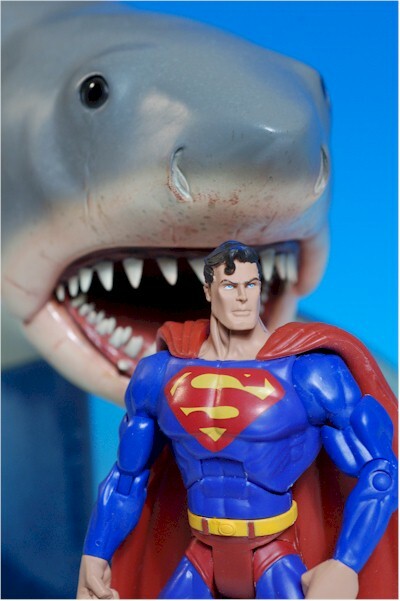 Sure, he's a big shark, but if you suspend him above a hunk of black polystone on a clear post (or worse, a metal post), he's just a big shark. As cool as a big shark is, it's not as cool as it could be. Instead, Sideshow came up with a terrific idea, that works perfectly. He's still suspended above that black base, but the thing doing the suspending is a wall of 'water'. 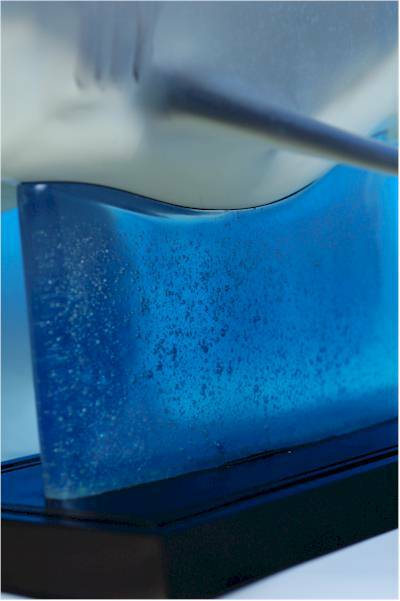 They've used what appears to be blue acrylic or Lucite, filled with tiny bubbles to further add to the water feel. This clear blue support is thick enough and solid enough to easily hold Bruce up in the air, and much, much more sturdy than any sort of basic combination of rods would have been. It does the job extremely well, and looks great doing it. What more could you ask for? Well, there is more. Sideshow included a 'nameplate' for the base as well. 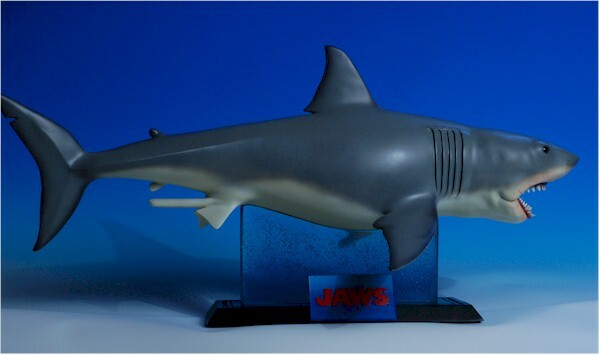 It has the title Jaws embossed on it, on a traditional blue background. What's so special about it? Well, there are lots of collectors that hate the name plates. They figure you ought to know who the Hell it is, without calling it out on a silly plate in front of the bust/statue/etc. Then there are collectors that love the nameplates, especially those that look like the traditional logos from the film or character. So how do you make them both happy? Sideshow does it by making the nameplate a separate piece that can sit in a set of grooves on the base. It can be placed on either side, or in front under the mouth, or even under the tail. Or, if you're not a fan, skip it altogether and the display still looks great. Kudos again to Sideshow for listening to their collectors, and doing everything they can to make them all happy. This is NOT a cheap maquette by any stretch of the imagination. The exclusive will cost you $280 from Sideshow, and while you can get the regular as cheap as $240 from some dealers, it's still an awful lot of green. Of course, this is also one huge hunk of polystone. While it's similar in overall dimensions to some of the larger PF's, Bruce doesn't have little arms and legs but a very large, very solid full body. And in the very cool base, and the fact that these are all hand cast and hand painted to ensure their quality, and you can see where the price starts to add up. Still, I'm betting you'll see these hit ebay at less than $200 if you're patient, and aren't shopping for the exclusive. I wouldn't try laying him down in any way, shape or form. He can't be placed on his belly, because his whole body weight would rest on the fins on either side, and could easily break them. He can lay on his side because the distance between the fins isn't great enough, which means again he'd have to rest all his weight on the back and side fins. There's only two ways to rest this guy - on the base, or in the foam packaging. As much as I love my Bruce, I do have to admit that there are some minor issues with the paint and sculpt. They are enough to hold him back from four stars - along with a hefty price tag - but certainly not enough to bring him any lower. This is going to look fantastic in any home theater or media room set up. While some folks might think you're a big geek if you have a PF Darth Vader, they're going to think you're just a movie fanatic if you have Bruce. The appeal of this maquette as a decoration for the general home theater owner is probably much higher than the usual PF Star Wars or LOTR character, whereas the usual Sideshow collector probably thought it was a weird choice. Sideshow is the place to pick up the exclusive, which is on a second chance offer right now! () They had a few cancellations, so there's a short window here for you to snag one direct. - Dark Shadow his the regular in stock for $238. - Alter Ego has the regular for $238. - if you're looking for something a tad cheaper, yet Jaws related, Clark Toys has the Jaws 3D poster in stock for $17. 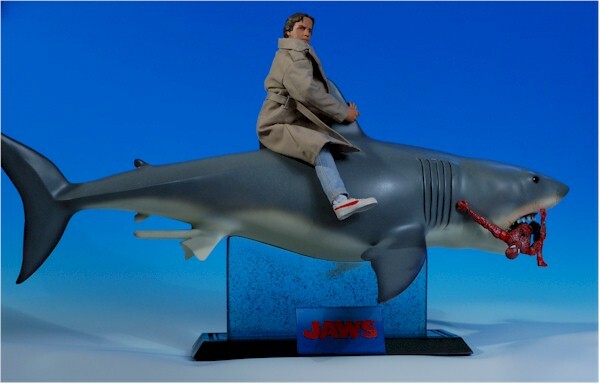 - One of the two best deluxe sets ever produced by Mcfarlane in their Movie Maniacs line was the Jaws set, complete with Quint. 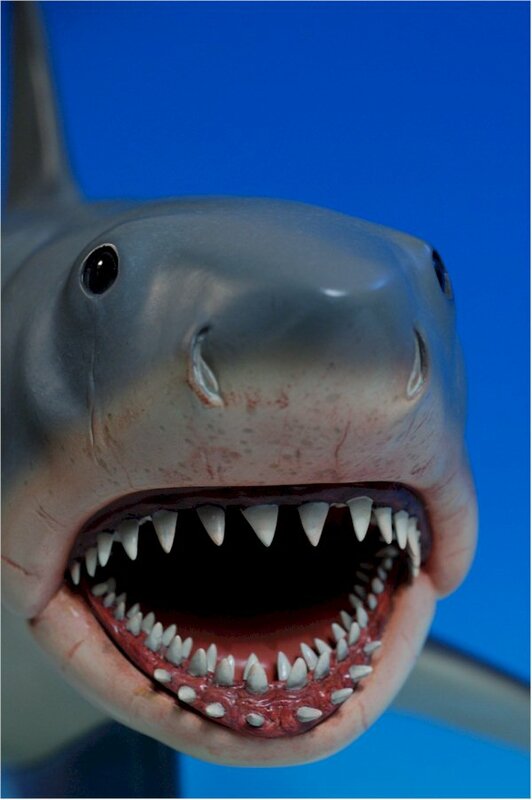 - And while he has nothing to do with the shark, let's not forget that Bond also had an adversary named Jaws.